Since 1986, the residents of Aomori City wish to make winter more enjoyable have been making efforts to promote curling as a winter sport. In December 2002, the Aomori City Sports Complex was refurbished, with a new curling rink in an annex used exclusively for the winter season. This will be the training site for the upcoming championship. Aomori City has played host to two international curling competitions so far - the 5th Winter Asian Games, held in February 2003, and the 13th Pacific Curling Championship, held in November of the same year. Aomori City recommended that the National High School Curling Championship be included in the national government's Project to Create Local Sporting hubs. It was selected for the project, and was held in 2006. We are working towards establishing Aomori City as a 'city of curling', based on our past achievements, so we have decided to host the World Women's Curling Championship in March 2007. 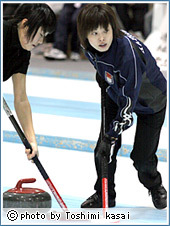 'Team Aomori' was the women's curling team selected to represent Japan in the 2006 Torino Olympics.